Garlic has an endless amount of uses from medicinal to cooking delicious meals. 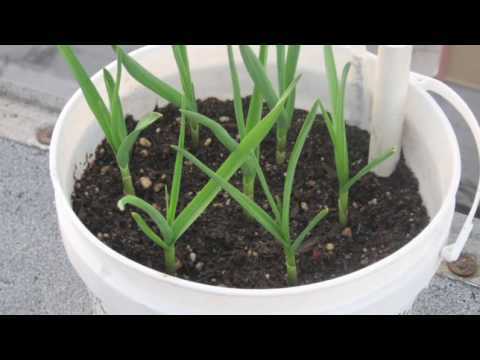 Many people want to learn how to grow garlic indoors because it is easy and inexpensive. If you eat a lot of garlic, growing your garlic is cost effective. Garlic is a simple ingredient with some great benefits and a delicious flavor. Garlic has long been revered as a way to cure many ailments. It contains many substances such as potassium, calcium, magnesium, Vitamin C, D, B and essential oils. Researchers show that garlic contains allicin that is known to help cure infections faster. If you want a natural way to fight fungal infections, using garlic is a safe and effective method to do so. Anyone can learn how to grow garlic indoors! If you lack space outdoors or a garden, you can grow bulbs in a window sill. If you are urbanite and have a patio, you can bring pots of garlic outside to get great sunlight. More than ever, people desire the knowledge to grow their food. When you grow garlic indoors, the method is a bit different than you would think. You have to use an existing garlic clove to produce a bulb. It takes months to create a garlic bulb. During this time, you will produce garlic sprouts or greens. They can be clipped as they grow for flavoring or garnishes. They aren’t the same thing as green garlic but still are perfect for cooking. They don’t have the same medicinal properties as typical garlic. Before you start, you have to remember that growing garlic takes patience. In general, you can expect it to take anywhere between three to ten months to mature. It all depends on the variety of garlic you selected to grow. One of the great reasons to grow garlic indoors is that you don’t have to wait for fall; you can raise it any time of the year you want. For those who want to grow more than one garlic bulb at a time, the pot should be large enough to accommodate bulbs planted four inches apart and four inches away from the sides. Not all garlic bulbs are suitable for growing indoors. If you take a trip to a local plant nursery, you want to select a whole garlic bulb instead of the planted parts called cloves. It is a wise idea to purchase from a local gardening store instead of the supermarket. The ones there tend to be treated with chemicals to avoid sprouting. They won’t produce any sprouts for you! In your selected pot, you should mix potting soil with gardening sand. The correct ratio is three parts soil to 1 part sand. As you fill the pot, you should leave one to two inches between the top of the ground and the rim of the pot indoor grow lights to hang over the pots. This part is the most important, so take your time. With your garlic bulb in hand, you must separate the cloves. The flat end of the clove should be at the bottom, facing down. The pointed end needs to face upwards. You want to leave the peel on the cloves as intact as possible. If the skin splits somewhat, that is fine, but removing the peel will slow down the growth. Each clove should be planted four to six inches into the soil. Once they are pushed down, you want an inch of soil to cover the top of the cloves. Measure four inches between each clove of garlic. Like all plants, garlic needs the right amount of sunlight to grow. The best place to store the garlic pot is wherever receives eight hours or more of sunlight each day. Many people like kitchen window sills, but there may be other options that work just as good. South facing windows will give you the most sunlight. If you don’t have a window, some people purchase indoor grow lights to hang over the pots. To get a healthy harvest of garlic, you must make sure you are correctly taking care of the garlic plants. Watering the garlic is crucial. When you water the garlic, you want to make sure you place the container somewhere that the water will drain well, such as a sink. The water comes out of the holes in the bottom of the pot. Check the soil each day for dryness and determine if watering is necessary. Soon, you will notice small, green shoots popping up through the soil. These green leaves will resemble chives. You will see flowers growing. Remember to clip them at the base when they sprout, so all the energy is diverted back to making the bulb grow larger. The best time to cut the greens is when they are eight to ten inches tall. You can use these clippings as flavoring or garnish. Any recipes that call for scallions or garlic can use the greens instead. You will get several clippings before they stop producing more. It takes lots of time to produce a garlic bulb. You will want to harvest your garlic eight to ten months after you planted the bulbs. You will know the time has come because the leaves turn brown and begin to die. To avoid damaging the bulbs during harvest, use a fork or scissors to harvest the bulbs. Once you have harvested the garlic for the year, you need to hang the garlic in a cool, dry place. Many people select garages or basements. They take around a week to dry. Once the garlic is dried, you can use the cloves for anything that you desire. It is important to note that, if you want fresh garlic cloves, you can’t clip the sprouts. The leaves have to stay on the plant, and you need a lot of sunlight. Garlic needs the sunshine for several months to produce fresh cloves. It is possible, but you have to forfeit a steady supply of garlic sprouts for bulbs. To produce a consistent harvest of sprouts, you need to plant the second pot when you clip your first crop of greens. This method means the second pot will be close to harvest when the first pot is done. Because it doesn’t produce a new bulb, you can dump the entire container in the compost. Learning how to grow garlic indoors is an easy process. The greens you harvest are great in most recipes. If you opt to forego the greens for bulbs, you can grow a huge supply; garlic stores well for over six months in the right condition. We know this article helped you understand the process. Have you ever grown garlic indoors? Let us know about your experience, as well as any tips or tricks.